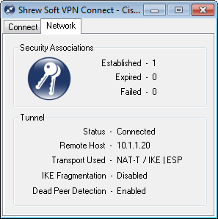 The VPN Connect application is a user interface component that was designed to interact with the IKE Daemon. 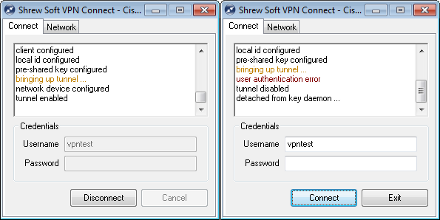 To open a VPN Connect application instance, please use the VPN Access manager application. The connect window may look different depending on the style of authentication that has been configured for the site. When the user presses the 'Connect' button, the site configuration information is passed to the IKE Daemon along with a request to initiate communications. Messages regarding the connection state will be displayed in the status output window. If the connection succeeds, the 'Connect' button text will change to 'Disconnect'. Otherwise, an error message will be logged in the status window and the connection will be closed. The Connect attempt succeeded for the window on the left but failed for the window on the right. When the user presses the disconnect button, a request to terminate communications message will be passed to the IKE Daemon. This may take several seconds to complete as the IKE Daemon will make every attempt to terminate the communications gracefully and cleanup any resources it may have allocated before sending a final status message. By selecting the Network Tab, it is possible to view the current network statistics for the connection. 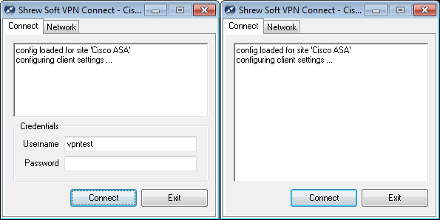 This tab also details the current connection status, the network address for the remote peer, the negotiated network transport and the current number of established IPsec Security Associations.